The first time people try this soup, there is a pause and then the raving begins. Even the quiet ones speak up about how good it is. Since I received my hand-me-down immersion blender, it’s even easier to make. I like to make a double-batch so I have some to give to friends who are also freezing in the Minnesota winter and so that I can eat it all week long.Since wild rice is native to Minnesota, it’s not expensive and adds great texture and flavor. A winter staple for me, this is a great soup for just about everything. You can have it for lunch, dinner or as a starter course for a dinner party (in small portions), and it freezes well. 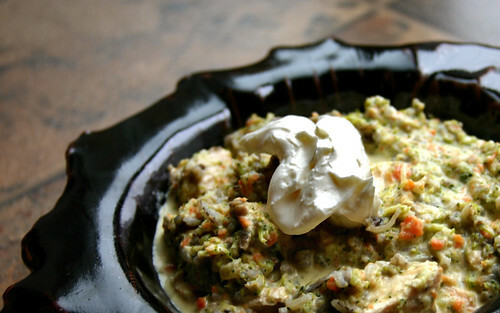 Add a dollop of sour cream to the top for presentation and added richness. This recipe comes from The Best of Wild Rice Recipes by Beatrice Ojakangas. In a heavy pot, melt the butter; add the onion and mushrooms. Saute for 5 minutes or until the vegetables are cooked. Add the broccoli, carrots and chicken broth. Simmer until vegetables are tender. Turn into a blender (or use an immersion blender—so easy and convenient, plus much less to clean up) and process until smooth. Add the flour and cream; blend until smooth. Return to pot. Heat to simmering and cook until thickened. Add the chicken and wild rice. Add salt and pepper to taste. I like to add a few dashes of hot red pepper flakes for a slight kick, too, but that’s up to you. Wash wild rice in three changes of hot tap water; drain. In saucepan, heat rice, water and salt to boiling. Reduce heat and cover. Simmer until rice is tender and has absorbed the water, this will take from 25 to 40 minutes. Drain at the 25-30 minute mark for chewier rice. Rice should be tender but not “rolled back” or mushy. Some kernels will be open, but others will be just tender. Wow, such a rich soup! Must be healthy and filling. Nice soup. Love those thick and hearty types! This is a great soup! I can’t wait to try it. With the new change with foodbuzz.com I would love to keep updated. It subscribed to your feed. I would love it if you follow me too! Looks like the perfect way to chase the cold away. I love my immersion blender too. This soup looks soul satisfying and comforting. You drew me in with wild rice and hooked me with the soup – two of my favorites. And a grand way to beat the MN winter. Shall keep this – I am compelled by taste to try all wild rice soup. Yours is wonderfully rich and hearty. I made this soup last night and it was delicious! I have a very happy husband and some delicious leftovers for lunch today. Thanks for letting us know, I’ll pass it along to Kate!